For over a decade Pokémon fans have been facing-off against one another in fierce trading card based battles around the world. Today those battles go online, and anyone with a web browser can play. Today marks the launch of the open beta of the Pokémon Trading Card Game Online, where Pokémon fans of all shapes and sizes can participate in card based duels by simply signing up for an account and choosing a deck. Earlier this year The Pokémon Company launched a single-player version, the Trainer Challenge, paving the way for this full online multiplayer installment of the popular trading card game. The online launch coincides with the physical release of the Pokémon TCG: Black & White Emerging Powers theme decks and booster packs, each featuring pack-in codes to unlock special cards in the online game. The game features a broad selection of pre-made decks for players that would rather get into the game quickly. "Fans of Pokémon TCG now have the freedom to battle against one another regardless of location, and that's exciting for the entire Pokémon community," said J.C. Smith, director of Consumer Marketing for The Pokémon Company International. 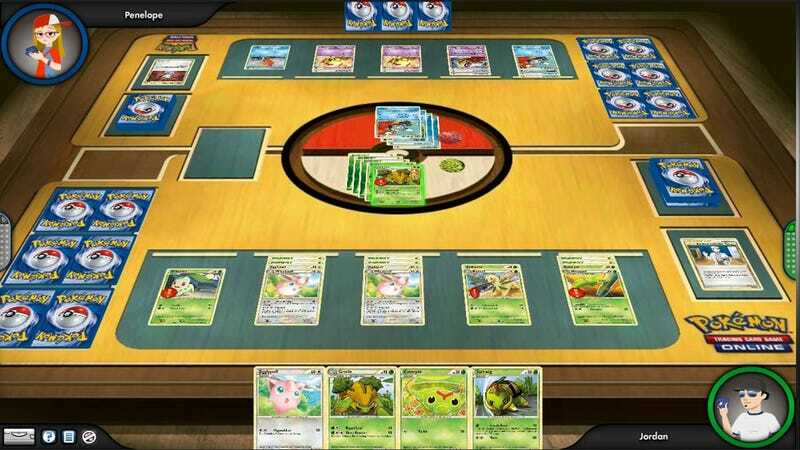 "Everything Pokémon TCG players love about the game is replicated in a rich, customizable online environment and our hope is that Pokémon TCG Online makes the game even more accessible to anyone who wants to play." I'd say it's done the trick. I've played a couple of matches already, and I actually understand what's going on. That might not sound impressive, but it's a milestone for me. Let me savor it. Go play.